Tides of War opens in England with the recently married, charmingly unconventional Harriet preparing to say good-bye to her husband, James, as he leaves to join the Duke of Wellington's troops in Spain. Harriet's and James's interwoven stories of love and betrayal propel this sweeping and dramatic novel as it moves between Regency London on the cusp of modernity---a city in love with science, the machine, and money---and the shocking violence of the war in Spain. With dazzling skill, Stella Tillyard explores not only the effects of war on the men at the front but also the freedoms it offers the women left behind. 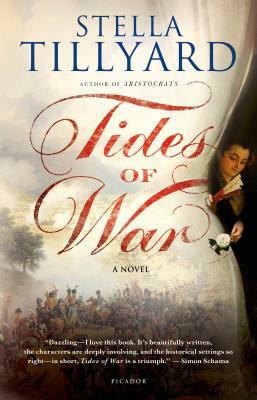 A powerful rendering of the Napoleonic era and a brilliant examination of battles yet to come, Tides of War is "one of the most assured literary debuts in years…the perfect answer to anyone who believes that the past is out of date" (Amanda Foreman, Financial Times). Stella Tillyard has been described by Simon Schama as "dazzling . . . a phenomenally gifted writer." Her books include Aristocrats: Caroline, Emily, Louisa and Sarah Lennox, 1740-1832; Citizen Lord: Edward Fitzgerald, 1763-1798; and most recently A Royal Affair: George III and his Troublesome Siblings. She has lived in the United States and Italy and now lives in London.